Last season, when Manchester United came back from 2-0 down to earn a 2-2 draw against us, I headlined my report Pride ahead of disappointment at Old Trafford and, as I write this season’s report I could just about use the same headline and, to an extent, the same report. if anything, last night’s 2-2 draw was harder to take than the one on Boxing Day last season. This time we were still two goals in front with only three minutes of the ninety remaining and it looked to all intents and purposes that we’d finally got our first win there in 56 seasons, since a John Connelly hat trick and further goals from Andy Lochhead and Jimmy McIlroy gave us a 5-2 win. Ashley Barnes and Chris Wood had both scored for us but then, as so often happens to teams there, we conceded two late goals and had to settle for a point just as we’ve done on each of our last three visits. The first of them was from a soft penalty although I think there must have been a gunman in the crowd who fired at Jesse Lingard to force him to go down like that, and that equaliser, from the pictures I’ve seen, looked to be offside. As is always the case when the white stuff comes out of the sky, much of the pre-match talk was of the weather and the potential difficulties of getting there despite it not been too far. As it turned out, it proved to be nothing like as bad as it might have been and there didn’t seem to be any alarming stories to tell from those there when the big talking point became the team news. The starting eleven, as I thought it might be, was the same as that which had drawn at Watford ten days earlier but it was the bench where the surprises cam. Jόhann Berg Guðmundsson made it but Robbie Brady didn’t. There’s a concern there with Sean Dyche reporting that his injury is being assessed. The big surprise was no Steven Defour. He’s played in the two FA Cup ties against Barnsley and Manchester City and has been on the bench in the league games between them, but there was no Defour last night with 19-year-old midfielder Josh Benson stepping up. This was always set to be a tough night. Manchester United are a different animal since the departure of Jose Mourinho. They’ve won every game since, look capable of carrying that on. Although they are no Manchester City (and they did us no favours last night), they are still one of the best teams in the country playing as well as they’ve done for some time. Ahead of the game, a period of reflection was held as a mark of respect for Emiliano Sala and David Ibbotson. It was also, given this was United’s closest game to 6th February, in remembrance of the Munich Air Disaster some 61 years ago. I was six at the time and didn’t know about it then, but my dad used to tell me about some of the players who perished, none more so than Duncan Edwards who, he used to tell me, would have been one of the greats. 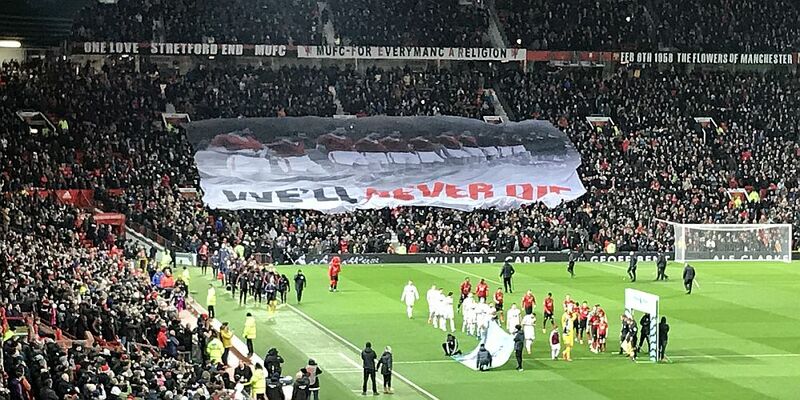 Supporters of both teams stood in silence with their teams as a large banner showing the iconic picture of that team was moved across the Stretford End. We kicked off attacking what I still refer to as the Scoreboard End. Our recent goals there in the Premier League have come at the Stretford End and I think our last league goal scored at that end came from Paul Fletcher. They started on the front foot, as you would imagine, but we stuck in there, defended well and the one real chance they had fell to Marcus Rashford who made a complete pig’s ear of it and fired wide. Slowly, but surely, we worked out way into it and for long spells in the first half we were every bit as good as they were. We did what we do well, defending when we had to and getting forward whenever we could. There might not have been any clear opportunities but by half time we didn’t look like a team ready to concede a goal and fully deserved to go in level. There were no Mr & Mrs Tom Heaton to talk to this year in the stand, apparently he was involved elsewhere. He’d made one very good save but for long spells had been fairly inactive other than the very audible encouraging of the players in front of him. United looked intent on stepping things up at the start of the second half and started to put us under some pressure, but that pressure was relieved six minutes in when one corner of Old Trafford went wild. This was the corner that wasn’t like a library, wasn’t like the Etihad and didn’t have a large percentage of tourists. What brought it on? Andreas Pereira lost the ball to Jack Cork who still had plenty to do. His little pass in for Barnes was inch perfect and Barnes simply hammered it left footed past David de Gea. Once more we’d taken the lead there and I was just wishing it had come a bit later. We knew we would have some defending to do after that, and we did. But, my word, how well we did it. I thought we were absolutely magnificent. When called upon, Heaton was majestic, but in front of him we were giving the sort of performance we’ve become so used to. It might be wrong to single out one player but I am going to make mention of Charlie Taylor. I am a big fan of Stephen Ward, maybe that’s why I’ve probably not taken to Taylor as quickly as some. Last night he was awesome, absolutely awesome. The home players move the ball around from left to right, right to left, trying to find shooting opportunities, but rarely could they find one so well did we do our job. Even so, I wondered whether we could hang on and then, with just nine minutes left, we doubled our advantage. Guðmundsson, on for Dwight McNeil, got down the right. He played the ball inside for Ashley Westwood whose cross was deftly headed home by Wood. By now it was pandemonium in the away end but there was still some work to do as referee Jon Moss, who ruined any chances we had of getting a result at Manchester City back in October, stepped in again. He gave them one penalty before having to reverse his decision but that had whetted his appetite and he just couldn’t wait to point to the spot when Jeff Hendrick put his hand on Lingard’s shoulder. Quite how he managed to go down like that only he will know, but we couldn’t have any arguments I suppose. Paul Pogba, with his hideous and ridiculous run up, scored and suddenly there were anxious moments. Just like last year, we got to the end with a 2-1 lead and just like last year the board went up for five extra minutes. The tourists roared their approval at this added time and got their reward. Heaton saved from Alexis Sánchez but Victor Lindelöf scored as the ball rebounded. Was he offside? I didn’t consider it at the time but from the pictures I’ve seen I think there is every reason to suggest the assistant should have raised his flag. At that game last season we had to ensure things didn’t get worse and we had the same again yesterday in the minutes remaining, to make sure we at least got a point from it. We did, thankfully. It’s never a bad point at Manchester United. We’d have taken it before setting off and should be very much accepting of it. But for the same thing to happen again is very difficult to take. I was devastated when that equaliser went in. We really didn’t deserve that. And from a personal point of view, I’ve seen us win league games on 99 different ground. What a fantastic place it would have been to take that total to 100. “I thought we were absolutely magnificent,” I wrote further up this report and I can’t find many more fitting words. That was Burnley, that was how we play, that’s what we love so much about our team and it is brilliant to see us playing like that again. Embed from Getty ImagesI’ve mentioned Taylor, and Heaton, but they weren’t the only ones. James Tarkowski had an outstanding evening and what about the front two? You can’t ask any more than what Barnes and Wood gave us. And a mention also for Phil Bardsley, Ben Mee and the entire midfield. Every one of them were heroes. Remembering that Pride ahead of disappointment headline. I’m still devastated that we couldn’t quite see it through yet again there, but that was a performance, along with some others recently, to leave you optimistic for the rest of the season as we go for those points we need to ensure we kick off 2019/20 in the Premier League. If we play like that, there is no doubt whatsoever. The players received a superb ovation from the fans at the end of the game – and no wonder. What a night despite those late goals which we really didn’t deserve. Manchester United: David de Gea, Ashley Young, Victor Lindelöf, Phil Jones, Luke Shaw, Nemanja Matic, Paul Pogba, Andreas Pereira (Jesse Lingard 62), Juan Mata, Marcus Rashford, Romelu Lukaku (Alexis Sánchez 67). Subs not used: Sergio Romero, Diogo Dalot, Chris Smalling, Fred, Ander Herrera. Burnley: Tom Heaton, Phil Bardsley, James Tarkowski, Ben Mee, Charlie Taylor, Jeff Hendrick, Ashley Westwood, Jack Cork, Dwight McNeil (Jόhann Berg Guðmundsson 78), Ashley Barnes, Chris Wood. Subs not used: Joe Hart, Ben Gibson, Stephen Ward, Josh Benson, Matěj Vydra, Sam Vokes. Yellow cards: Ashley Barnes, Charlie Taylor, Jack Cork.